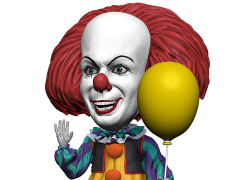 Pennywise Head Knockers stand over 8" tall with bobbling head. The killer clown is cast in resin and then hand painted for extra-creepy detail, down to the themed base. Comes in collectible matte finish packaging with spot gloss.